The Meyer Shank Racing Indy car driven by Jack Harvey will feature Acura livery in this weekend's Acura Grand Prix of Long Beach, marking the return of Acura colors to the NTT IndyCar Series for the first time since 1994. The one-off design for the AutoNation / SiriusXM #60 entry celebrates the start of Acura's tenure as title sponsor of the Southern California racing classic. 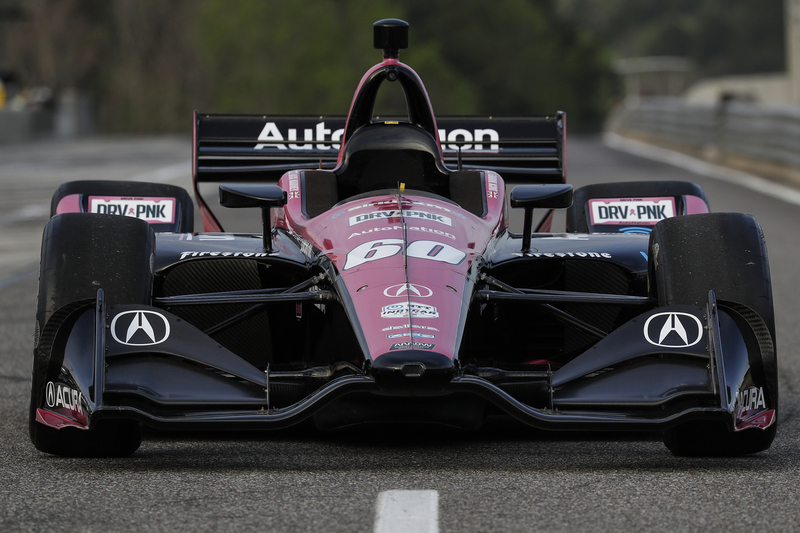 The #60 Meyer Shank Racing IndyCar driven by Jack Harvey will feature Acura badging this weekend to mark the companys debut as title sponsor of the Acura Grand Prix of Long Beach. Acuras only previous involvement in IndyCar racing came in 1994, when the company sponsored the #49 Comptech Racing car driven by Parker Johnstone. “Given our long-running, successful relationship with Meyer Shank Racing in sports car competition, it seemed only natural to mark our first year as title sponsor of the Acura Grand Prix of Long Beach by extending our brand to the MSR Indy car,” said Jon Ikeda, Acura vice president and Brand Officer. In place of the usual Honda brand on the engine cover and “Circle H” nose logo, the MSR chassis will carry Acura branding on the engine cover and rear wing endplates, with the “Caliper A” logo on the nose and upper front-wing elements. In addition to Acura branding, the #60 AutoNation/SiriusXM entry will continue to feature the “Drive Pink” campaign to support breast cancer treatment research. In addition to its Indy car program, Meyer Shank Racing fields a pair of Acura NSX GT3 Evo’s in the IMSA WeatherTech SportsCar Championship, and has scored four class victories and two poles in the highly-competitive GTD category since 2017. The #57 Caterpillar sponsored MSR Acura NSX GT3 Evo, raced by the all-female driver lineup of Katherine Legge, Bia Figueiredo and Christina Nielsen, will be on display in the atrium of the Long Beach Convention Center throughout the Acura Grand Prix of Long Beach race weekend. The only previous time Acura featured on an Indy car entry was in 1994, when the division served as primary sponsor of the Comptech Racing Lola driven by three-time IMSA champion Parker Johnstone. The Comptech Lola featured Acura logos and branding, and Johnstone took part in six Championship Auto Racing Teams (CART) events that season, in addition to running an extensive testing program.